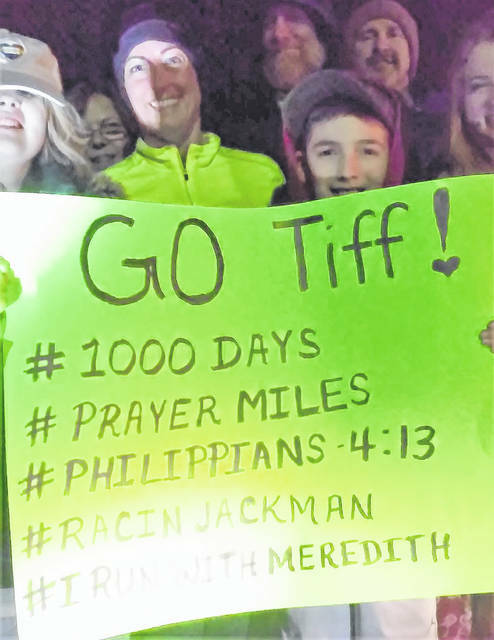 Shortly before midnight Friday, 30 of Tiffany Miller’s closest friends gathered in the parking lot of Southern State Community College in Hillsboro to help the Fairfield school teacher celebrate 1,000 consecutive days of running. Shown, from left, are Anna Fleming, Tiffany Miller and Ethan Fleming holding a sign commemorating the event. The longest streak for consecutive days running is 47 years and 8 months, according to Runners World magazine, but a teacher from Leesburg crossed the 1,000-day milestone Saturday morning shortly after midnight from the parking lot of Southern State Community College in Hillsboro. Tiffany Miller is a K-5 technology teacher at Fairfield Elementary School, owns the record that began back on April 17, 2016 and as of Saturday, had totaled an amazing 2,916.28 miles running since the streak began. Nicki Dunn and Amanda Raypole, both of Greenfield, go to church with Miller at Good News Gathering in Hillsboro, and told The Times-Gazette that how she feels or what the weather conditions are doesn’t hold her back. Her friend Nicki Dunn recently had knee replacement surgery and planned to walk with the group early Saturday morning … or hobble. There is a method — or mission — to her madness, and Raypole said that Miller will write on her hands certain names or something specific that she wants to pray about. Miller’s march to 1,000 consecutive days running began on a cold afternoon a few years ago during the Highland County Board of DD “Dash for DD,” a fundraising event that celebrated March as Developmental Disabilities Month. She said God turned something she hated into something she felt she needed to do with Him, and it became more than just running up and down Underground Road near her home between Highland and Leesburg. Her ministry of running began to involve posting her runs along with scripture on Facebook, drawing a verse of the day from a Bible app on her phone, or a verse that for some reason spoke to her about something or someone. Miller’s ministry also includes Who I Run 4, a non-profit organization that matches runners with “buddies” who are special needs children and adults. She was on a waiting list for months being matched with Meredith, a young woman who suffers from a number of chronic illnesses. Miller said she has never met her, but Meredith insists that if she ever competes in the Boston Marathon she’d be there to cheer her on. Miller swore off marathons, figuring running up to three miles a day was enough, until deciding to compete in the Mother Road Marathon in October 2017. She completed her second marathon last May when she ran in Cincinnati’s Flying Pig and intends to run again in October during the Columbus Marathon for Nationwide Children’s Hospital, where she plans to run with her friend Michele, who is successfully battling lung cancer.